Linda Mary Montano (born January 18, 1942, Saugerties,NY) was raised in a devoutly Roman Catholic household, partly Irish and partly Italian, that was surrounded by artistic activity. Both her parents played in an orchestra but Linda’s fascination with Catholic ritual and desire to do humanitarian service led her to join the novitiate of the Maryknoll Sisters after one year studying at the College of New Rochelle. After two years with the order, however, Montano was suffering from severe anorexia, weighing only 80 pounds (36 kg), and she left the order to return to her former college, from which she graduated in 1965 as a sculptor. During the rest of the 1960s, Linda continued to study and began performing, and by 1971 she was devoting herself exclusively to performance art. Around this time she married the photographer Mitchell Payne. During this period, Montano drifted away from the Catholic Church, but despite this loss faith, Montano was consistently to acknowledge the influence of her strict Catholic upbringing on her work – for instance in how the discipline of convent life and her family’s loyal work-ethic made her able to carry out extremely disciplined performances in her later career. Montano’s first major performance, Chicken Woman (1972) was based on her MFA sculpture show at the University of Wisconsin, Madison. There she exhibited 9 live chickens in 3, eight by sixteen foot long minimalist chicken wire cages on the roof of the art building. It was titled “The Chicken Show” from 1969. Linda had moved to San Francisco 1970 with her husband, and it was there that she established herself with performances like “Handcuff” (1973 with Tom Marioni) where she was physically tied to other artists, and “Three Day Blindfold” (1974), where she lived for three days blindfolded and had to find her way around. The death of her husband led to further exploration of art as a healing modality (“Mitchells’ Death”, 1978) and she continued her art-theology dialogue by living in a Zen monastery for three years and to Ananda Ashram in the 1980s where she studied with Dr. Ramamurti Mishra for over 30 years. His influence and appreciation of her vision encouraged both her art and life. Upon meeting Tehching Hsieh, Montano joined him in his Art/Life: One Year Performance and they endured a remarkable collaboration whereby the two artists were bound to each other by a length of rope 24 hours a day for a whole year (from July 4, 1983 to July 3, 1984). In the following seven years Montano did another ambitious project titled “Seven Years of Living Art”, in which she lived in her home in Kingston wearing strictly monochromatic clothing, spent a portion of every day in a coloured room, and listened to a designated tone, all of which corresponded to the energetic qualities of a specific chakra. She changed colour every year, and after the project was finished followed it up with “Another Seven Years of Living Art”, in part to memorialise her mother, Mildred Montano, who died in 1988 of colon cancer. Montano continued wearing one color clothing for those next seven years and practiced similar inner/outer disciplines while also donating herself as a LIVING SCULPTURE to the United Nation’s Chagall Chapel. From 1998-2019, Montano has created an online school for artists wanting to use her recipes for making art from everyday life. This performance is titled: Another 21 Years of Living Art. After this, Montano focused upon freelance teaching of performance art, caring for Henry Montano (her increasingly ill father) and counseling people again practicing “Art/Life Counseling”, a technique she used for seven years at The New Museum where curator Marcia Tucker had built a private room and allowed Montano to counsel people once a month in the window installation which was painted the same color that Montano wore for that year. 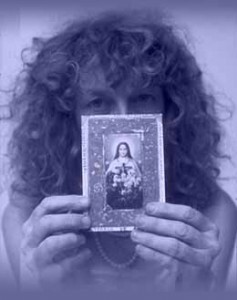 At that time (1984-1991) Montano used tarot, palm and psychic readings as tools of discovery as well as attentive listening so that she could respond to the questions of her clients and she intended to find the most creative way to respond to their problems and difficulties. (Currently Montano still does “Art/Life/Laugher Counseling” but without the assistance of tarot, palm and psychic readings because they are forbidden by her current practice of Catholicism). The influence of her father led Montano to return to Catholicism and ultimately to Church attendance, and since 2005 she has taken gathered prayer requests to more than ten Catholic pilgrimage sites throughout the world. Montano also meets with others in Catholic Churches for 3 hours silent retreats, re-seeing the concept of endurance from new Catholic-eyes. Since returning to Catholicism, Montano has made numerous videos exploring the faith, including Father Lebar: Catholic Priest and Exorcist; Saint Teresa Of Avila By Linda Mary Montano, and currently Mother Teresa of Calcutta. She also performs three-hour endurances, lip-syncing as Paul McMahon and Bob Dylan. Her work investigates the relationship between art and life through intricate, life-altering ceremonies, some of which last for seven or more years. She is interested in the way artistic ritual, often staged as individual interactions or collaborative workshops, can be used to alter and enhance a person’s life and to create the opportunity for focus on spiritual energy states, silence and the cessation of art/life boundaries.